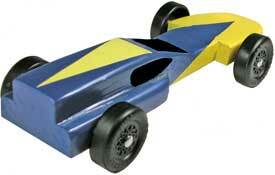 How to build this Starfighter Pinewood Derby car. It's as easy as ABC! The Starfighter requires more cuts than our simpler designs. Some of the cuts have sharp corners so a coping saw or band saw is suggested. 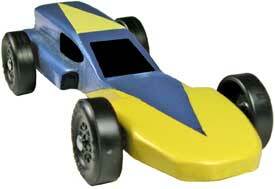 A wood rasp is recommended to help shape these cars (available from our tools page). All of our Pinewood Derby car designs include step-by-step instructions for building your car including templates and the paint scheme shown here.